Dispel with isn't a thing. Marco Rubio's broken record in the GOP debate was grammatically incorrect. The Other Problem With Marco Rubio’s Broken Record: “Dispel With” Isn’t a Thing. 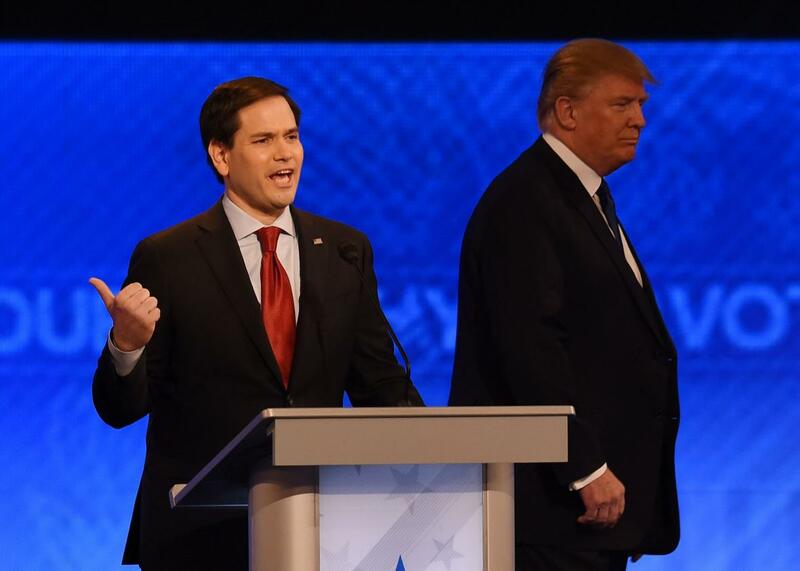 Marco Rubio and Donald Trump, before the start of the GOP primary debate on Feb. 6, 2016 at St. Anselm’s College Institute of Politics in Manchester, New Hampshire. Chris Christie went nuts, saying Rubio was regurgitating a “memorized 25-second speech that is exactly what his advisers gave him.” But you know who else should’ve been wincing? Grammar fiends. One final problem with Rubio's answer: You don't "dispel with" something. You either dispel it or you dispense with it. As Weigel notes, dispel with isn’t really a thing. You can dispel something, sure. (Rubio did little to dispel concerns that he’s not fit for the White House, for example.) But if you want to use with after a verb, then dispense is more appropriate. A quick Google search illustrates the uniqueness of Rubio’s word choice. A search for “dispel with” that’s restricted to results prior to Saturday night’s debate shows mostly mentions about video games. It seems Dispel is a spell in Final Fantasy. And you can apparently use Dispel with all kinds of things, including the Holy Torch. That’s probably not what Rubio had in mind.